It struck me recently that while we <em>frequently</em> advise our clients and partners on the SEO potential held in their site’s global navigation, how to structure site nav for SEO and UX benefit is something a lot of marketers don’t immediately consider. And that’s a problem. As somebody who usually blurts out “video games” when asked about favorite hobbies (yes, it’s true, Portent does hire a bunch of nerds), I spend a lot of my leisure time navigating through menus. Anyone who’s had to wrestle with a game just to achieve a simple setup task knows how negatively a menu can impact overall user experience. “Why do I have to go through a six-button sequence just to get to my potions? !” If that sounds like your company website, this post is for you. Why Does Site Navigation Matter so Much for SEO? A website’s global navigation holds what are arguably the most important links on the site. For user experience, the global nav links tell a visitor or prospect which pages you consider the most important on your site. It gives them an easy way to get to those pages and sets the tone for what they’ll find throughout. For SEO, the global nav links tell search engine crawlers which pages you consider the most important on your site, and gives them an easy way to get to those pages. If you want a little more background on this, read the longer post about smart internal linking for SEO. But there are countless ways to structure a site’s global navigation. So which one is the best? If you were so inclined, you could stop reading right here, and improve your site right away. You might have the most beautifully and intuitively designed global navigation that has ever graced the internet, but if your nav items consist of only “Products”, “Solutions”, “Resources”, and “About”, you might as well have built your navigation in Macromedia Flash. If your site is all about building model trains, it’d be much better to have “Model Train Parts” than “Products”. Another example: if I were reading a blog post on an unfamiliar site that I’d found through search, and one of your global nav items is “Enterprise”, would I understand what your website is about? Or who it’s for beyond just “Enterprises”? For more about this idea, read this post about The Blank Sheet of Paper Test. The simplest, while not necessarily most common, global nav design is the single, plain bar. This bar has all navigation links in one row and is usually limited to around 10 links. Our friends down the street at Moz use a single-bar nav menu. In this case it’s fine that they use “Products” since they’re a very well-known, well-understood brand. Also, check out that great, descriptive “Free SEO Tools”! If you’re thinking in purely SEO terms (don’t), this is <em>the</em> ideal navigation. The links are immediately visible to search engine crawlers, there’s no worry of them getting buried in a poorly coded dropdown structure, and there’s a nice, small number of them. This is only slightly more complex than the single navigation bar. Instead of one bar, you use two. Some might refer to this as the primary and secondary navigation, but for the purposes of this post, I’ll count them as one global navigation. Another from a friend in the industry: STAT uses the double-bar navigation with no dropdowns. I might be partial, but I think the Portent double-bar menu is quite elegant. This is before you scroll down. And this is after. The second bar disappears and “Services” appears. This is a pretty good “best of both worlds” solution. Using two global navigation bars gives you twice the space for links or more, depending on how you style the second bar. And, same as the single-bar solution, you don’t have to worry about a lazy developer (just kidding, I love you all, devs) coding a dropdown incorrectly, making it invisible to crawlers. But back to double-bar navigation. A dropdown menu is designed so that when a user hovers over (or, in some cases, clicks) a nav item, a secondary list of links drops down. Dropdown menus are probably the most common way to structure a site’s main navigation. Seller Labs, a Portent client, makes good use of the single-bar dropdown menu. Buddy, another Portent client, pulls off the rare double-bar dropdown. If you try this on your site, make sure the top dropdowns retract properly to get out of the way. For a lot of bigger sites, this is the only way you can possibly link to all the important pages without overwhelming a user with choices. However, as I’ve alluded to already, if you go this route, you introduce the risk of hiding all of these great, descriptive, sitewide links from search engines. This is the most complex menu structure, and it’s the easiest to mess up. Flyout navigation menus are just like dropdowns, except that a tertiary set of links flies out when you hover over one of the links in the dropdown. Can you imagine Amazon.com without the flyout menu items? Flyout menus have many of the same benefits and downsides as do plain dropdowns. If your flyout menu feels like a maze game you have to win with pixel-perfect cursor moves, maybe you should rethink either structure or design. <em>No, you can’t just stuff links to the other 100 pages you want to link to on every page of your site in the footer.</em> There’s plenty of evidence that Google devalues links in the footer, and your users aren’t going to be looking there unless they’re weirdos who like reading privacy policies. A footer menu (if you choose to use one at all) is where you can link to less important pages or provide easier-to-read links to pages you’ve linked to in your main navigation. Maybe I’m erring on the side of oversimplification, but these days the tenet “what’s good for UX is good for SEO” can be applied to a lot of “what’s best” questions. Not to mention it prevents me from having to give a Holy-Grail answer. Bottom line: craft a great user experience that doesn’t ignore the many technical considerations which can torpedo your SEO. Your visitors, both human and machine, will thank you. And since it’s 2018, I’m all-but contractually obligated to provide a TL;DR. If you have a tight handful of important site destinations, use single-bar navigation. If you need more room for links than a single bar and don’t need to group pages in multiple categories, use double-bar navigation. *Only if you have a savvy developer who can make it work for users and crawlers, ideally with some professional SEO oversight. And let me head off the pitchforks and torches before they come out: there are <strong>plenty</em> of variations on these menu styles that we could discuss, as well as many different names for the structures we did cover. If you vehemently disagree with any of this, let me know in the comments. 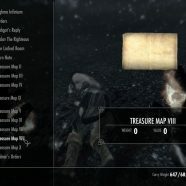 Oh, and if anybody can get me in touch with Bethesda Game Studios, I’ve got some thoughts on how to make the next Elder Scrolls’ inventory menu better. The post How to Structure Your Site’s Navigation for SEO and UX appeared first on Portent.